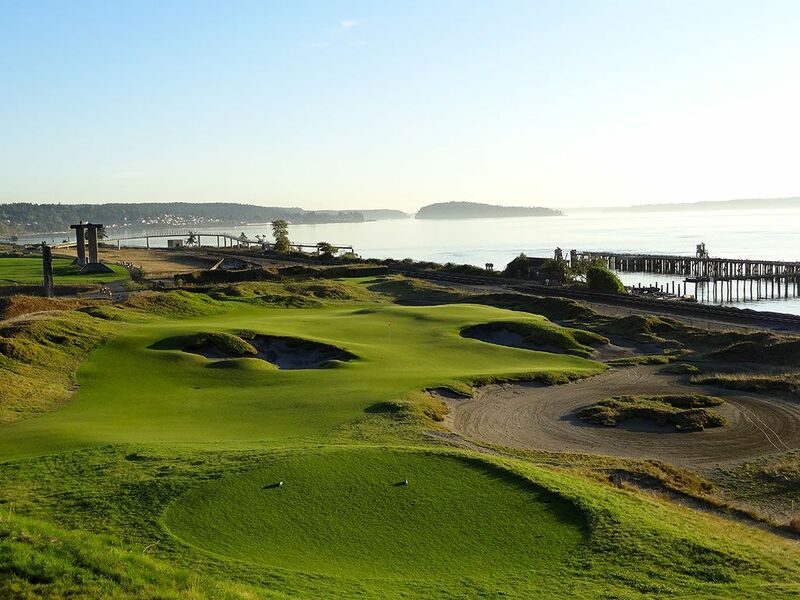 Course Website: Official Website - Visit Chambers Bay Golf Club's official website by clicking on the link provided. Accolades: Ranked 1st in Washington and 20th in America by Golf Course Gurus. Host of the 2010 U.S. Amateur and 2015 U.S. Open. What to Expect: Every once is a while you lace up your golf shoes and step onto a special golf course. You know it the instant you get there. There is something about the views, the environment, and most importantly the feel that tips you off to know you are in for an extraordinary experience. That is exactly what happened to me when I descended from the streets of University Place below to the links of Chambers Bay. 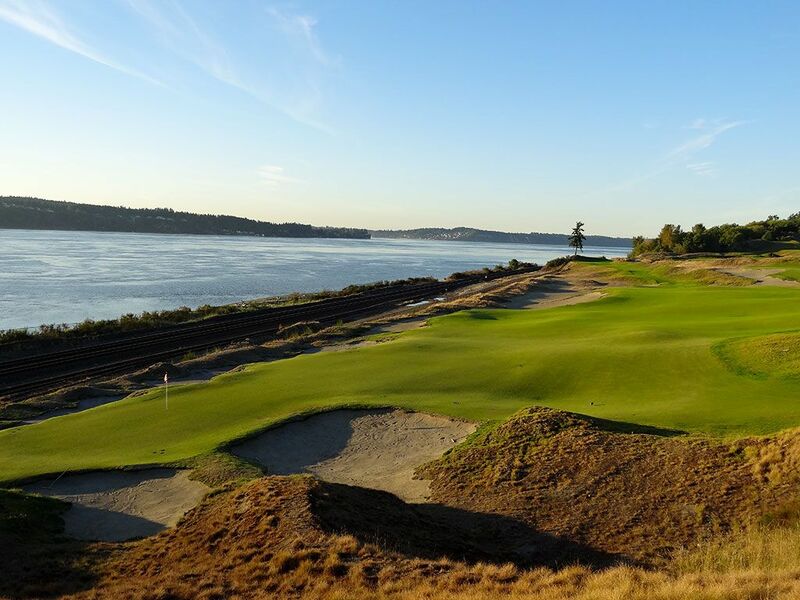 Built in a former rock quarry covered in sand, the course sits down in a giant bowl bordered by the railroad and Puget Sound on the west. 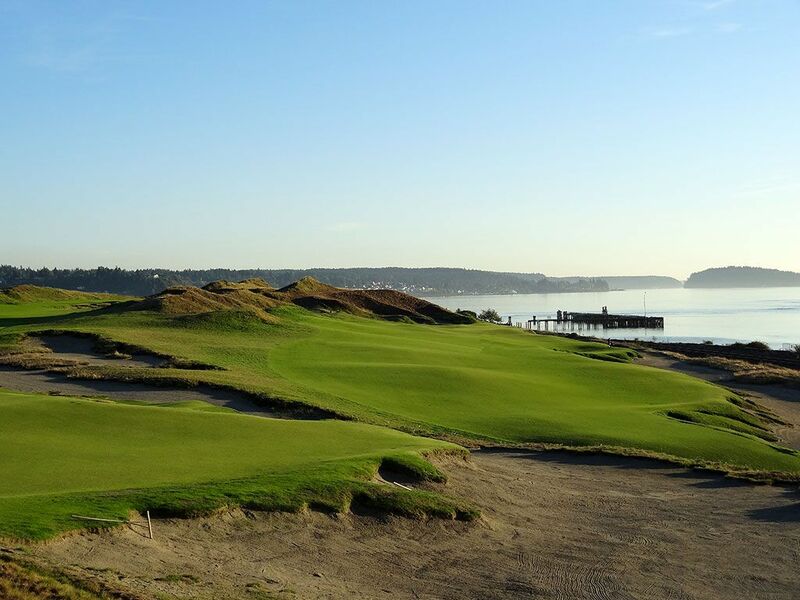 The true links style course features no interior water hazards, a single tree, and virtually no place to lose a ball. 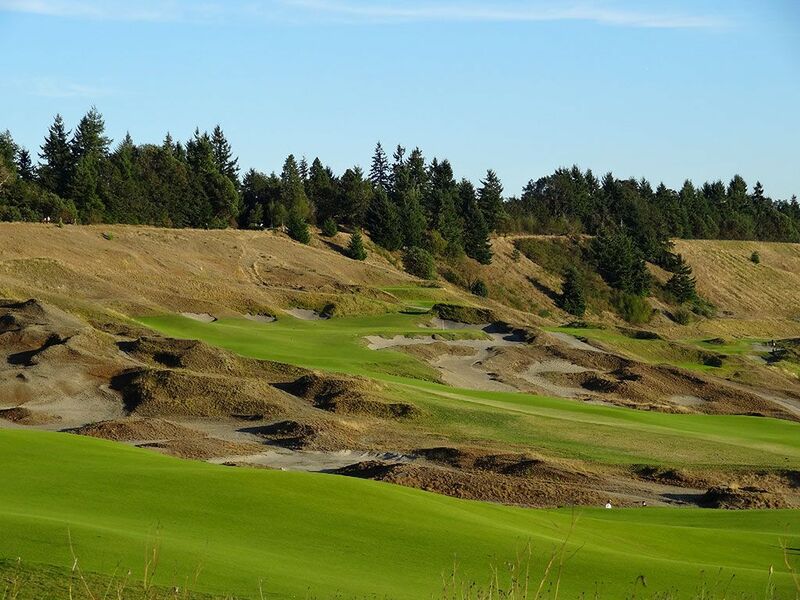 The huge undulated greens compliment the expansive fairways that sprawl around the large sand dunes and bunkering systems. Firm and fast conditions are the call of the day with the sandy soil that features a combination of bent and fescue grasses. This grass combination never gets very plush which allows for players to advance the ball on the ground and utilize the contours of the terrain. This type of grass also requires the course to be walking only as it cannot sustain the extra strain put on it by consistent golf cart traffic. As such, caddies are available for players wanting that experience but are not mandatory if you would prefer to haul your clubs on your back or utilize the specially designed push carts that have zero impact when wheeled across the greens. The back nine, and in particularly the final 4-5 holes, present some of the most scenic and engaging holes in golf and beg you to reround and take on the course again. 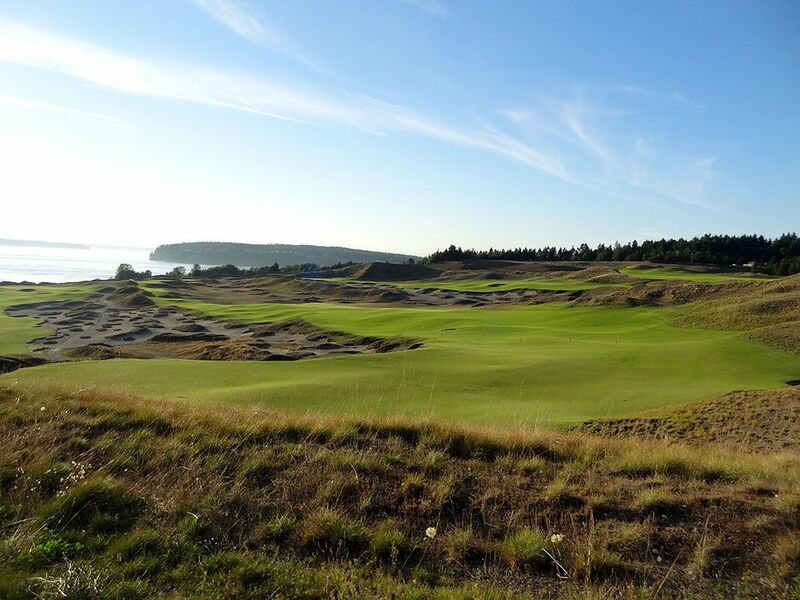 The natural comparison is with Bandon Dunes which clearly has a superior setting but Chambers Bay counters with a significantly more accessible location, affordable rate options, and at moments delivers superior design elements. On display for the world to see during the 2015 U.S. Open (and previously during the 2010 U.S. 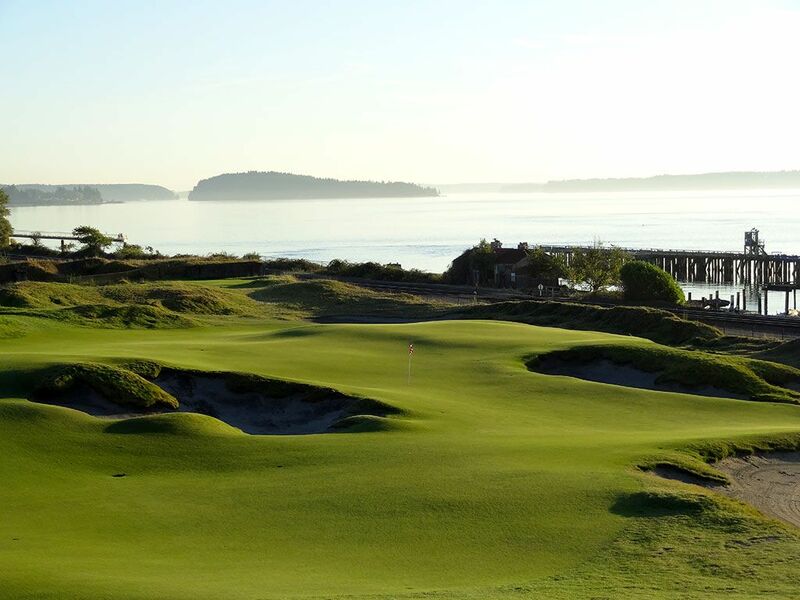 Amateur), Chambers Bay is a very special course and a must-play for any golfer wishing to experience pure links in the United States. Signature Hole: 15th Hole – 246/172/139 Yard Par 3 – The signature 15th hole sports the lone tree on the property which stands behind the large green and next to the 16th tee. 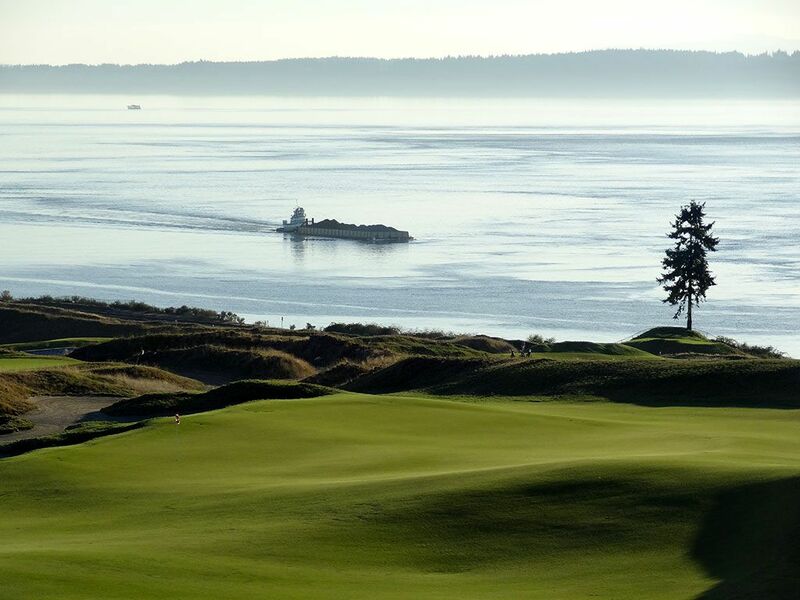 The most photographed hole on the course features a large bunker complex in the foreground and the glistening Puget Sound in the background. While the scorecard shows the blue tees at just 139 yards, there are additional tees that can stretch this hole all the way back to 246 yards. A tongue in front and spilling to the right feed balls away from the hole and often into sprawling bunker surrounding three-quarters of the green. Behind the back left portion of the green is a small pot bunker that very well could great the toughest up and down of the day. 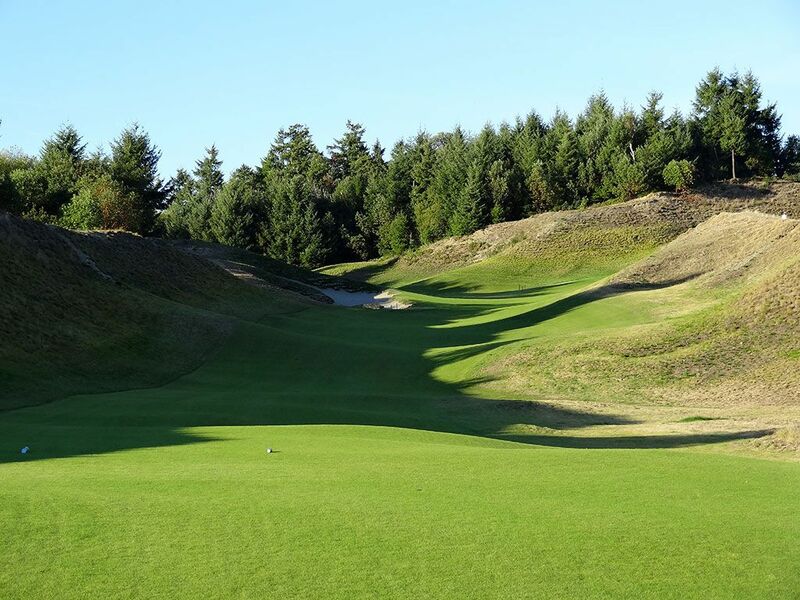 It is a beautiful hole from an elevated tee that offers a wide range of tees and pin options. Best Par 3: 17th Hole – 206/172 Yards – The attractive 17th plays from an elevated tee to one of the wildest greens on the property. The Puget Sound sits in the background on the right and large concrete relic-looking posts from a former storage building tower up on the left. A huge bunker runs up the right side of the hole from tee to green while a nasty wart bunker is found at the front left of the putting surface. The amount of creativity surrounding this green makes it the most entertaining and option laden hole on the property for your short game if you can put your imagination to work by envisioning how different contours and ridges will react. This is just a flat out fun hole. 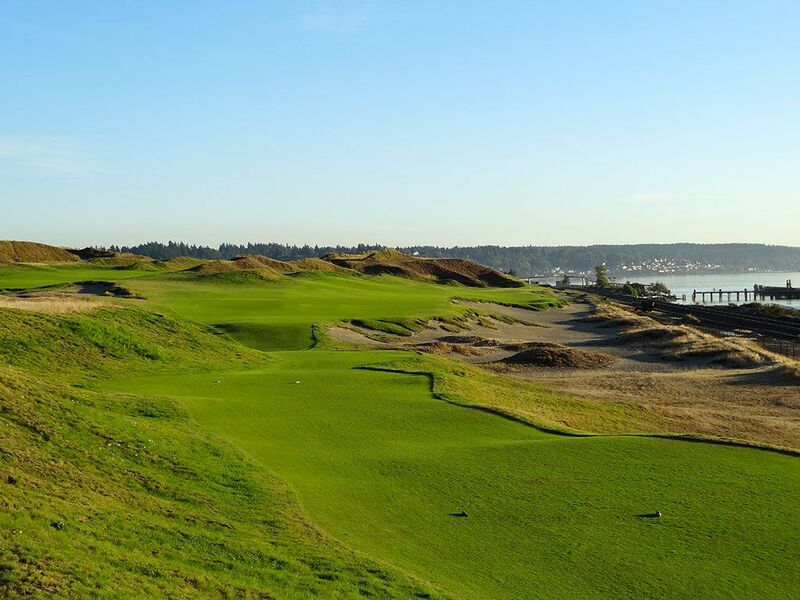 Best Par 4: 16th Hole – 425/396 Yards – The 16th hole runs south parallel to the railroad track and Puget Sound coastline and was very reminiscent of Pacific Dunes' 4th hole; just shorter. Hitting your tee shot up the left side away from the water offers safety with your drive but gives you an extremely difficult angle to approach the green. The fairway tightens down to a needle hole opening in front of the green as a bunker encroaches in from the left and it is recommended to land your approach short allowing the ball to roll up onto the putting surface since flying your ball all the way to the green will likely result in the ball caroming into the steep bunker right of the green. The long, narrow and slightly domed putting surface coupled with the bunkering on both sides make this approach shot the most demanding and potentially penal of the course. One guy in my group had a relatively straight forward ship from the front left of the green, hit a respectable shot, and watched it tumble into the sand. This hole is sure to cause trouble for more than one guy in your foursome. 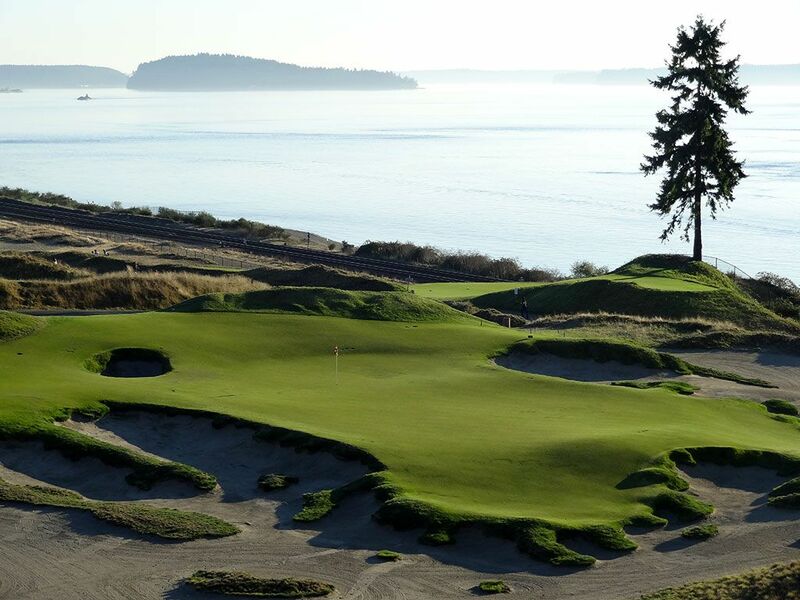 Best Par 5: 4th Hole – 568/530 Yards – Standing on the 4th tee at Chambers Bay reminded me of a hole you would see at Whistling Straits where there appears to be more acreage of sand than grass. This larger than live par five plays uphill from tee to green and doglegs right midway through the hole. The fairways slopes left to right towards the gigantic bunkering system that encompasses the right side of the hole all the way to the green. Reaching the putting surface in two is a healthy feat given the change in elevation and amount of trouble that surrounds the green. Two well placed shots up the left side of the fairway will open up the best angle into the green and give yourself and chance at a potential birdie. Beware of approach shots that leaks right as they will tumble into the steep bunkering next to the green and result in a very difficult up and down. Birdie Time: 12th Hole – 304/281 Yard Par 4 – This delightful short par four plays uphill through a draw carved between two large sand dunes. During the U.S. Open you will see this hole tip out at just over 300 yards yet during certain days it will definitely play less which will allow some competitors to hit 3-wood onto the putting surface. A bunker up the left side of the fairway blocks the green from view and requires players to either hit a draw around it from the tee or play a blind approach shot over it if laying up. 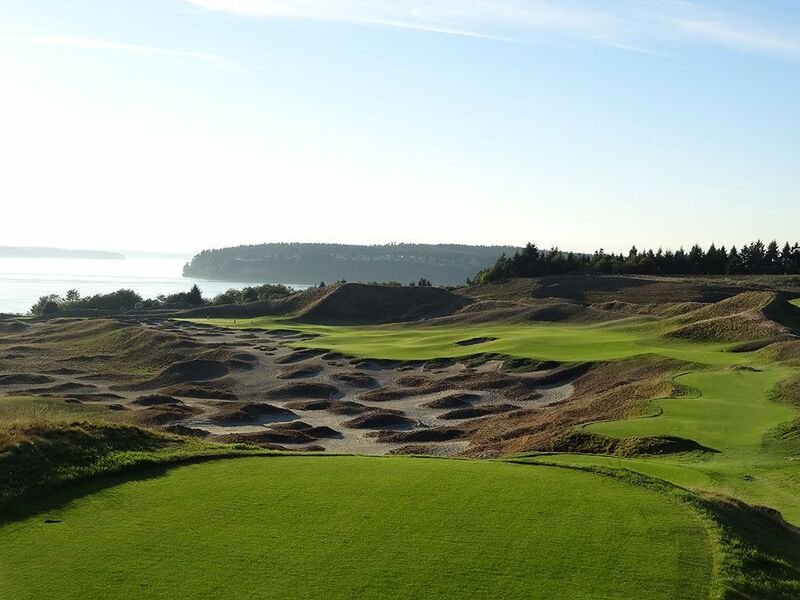 It is an attractive and exciting hole to play and a favorite among visitors to Chambers Bay. 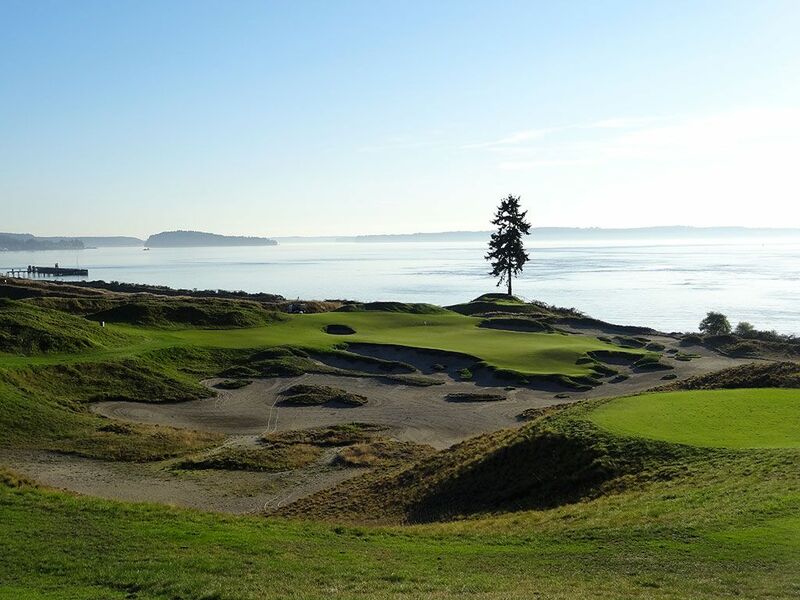 Bogey Beware: 14th Hole – 546/496 Yard Par 4 – The 14th hole starts the player's journey to Puget Sound in a brutal way with a par four that plays a whopping 546 yards from the back tee and nearly 500 yards a tee box up. A massive bunker runs the entire length of the inside portion of this dogleg left and will catch many tee shots that attempt to shorten the hole by cutting the corner. A small bunker in the center of the fairway represents an aiming point where going left of it will find a speed slot that releases serious distance while going to the right will leave a very lengthy approach shot. 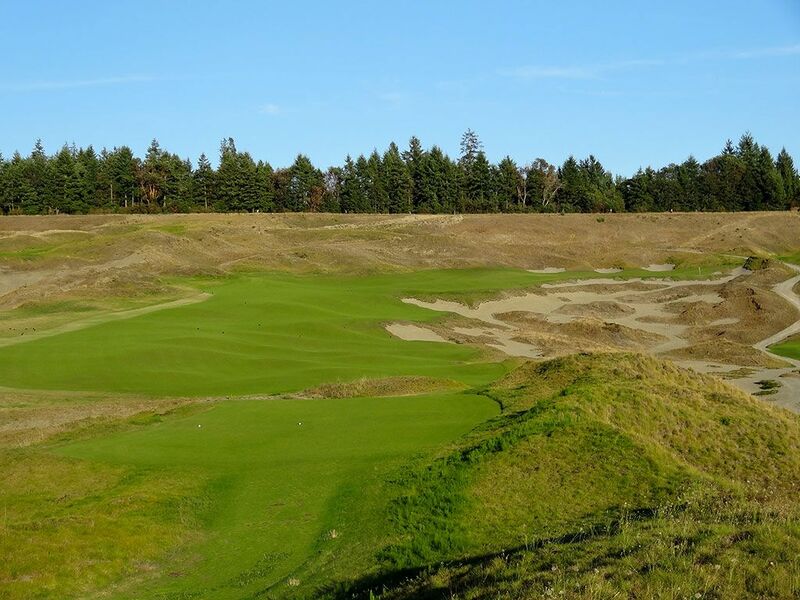 A large sand dune frames the right side of the green and tightens the opening into the green that is pinched on the other side by a sprawling bunker. Managing a four here is the most rewarding par on the course.